Dubai Properties today officially unveiled the Middle East’s largest living green wall at Dubai Wharf, located in the heart of Culture Village overlooking the historic Dubai Creek. Extending 210 metres in length and rising six metres high, the vertical garden spans 1,260 square metres and features over 80,000 plants forming a leaf canopy area equivalent to around 200 trees, capable of offsetting an estimated 4.4 tonnes of carbon dioxide (CO2) annually. Building upon the scientifically proven benefits of greenery within communities, such as having a calming effect and encouraging an outdoor lifestyle, the master developer sought to create a microclimate that enhances the aesthetic appeal of Dubai Wharf and the well-being of its visitors and residents. The stunning green wall provides a perfect backdrop for pictures and invites nature lovers for an idyllic stroll along the Dubai Creek shoreline. Living green walls are vertical gardens that are particularly useful in urban landscaping, where space can be a constraint. Plants naturally remove carbon dioxide and produce oxygen while filtering the air around them through absorbing pollutants. This beneficial effect is compounded by the sheer number of plants in living green walls. Speaking on the occasion, Raed Al Nuaimi, Group Chief Executive Officer of Dubai Properties, said, "As one of the top 20 happiest countries in the world and the happiest in the Arab region, according to the World Happiness Report 2018, the UAE is a keen supporter of sustainable living environments that are known to enhance the quality of life and elevate happiness levels." He added, "At Dubai Properties, we design our projects with a focus on the communities that will inhabit them. As part of this priority, we consciously integrate elements that are not only environmentally sustainable but also make our residents happy. The Dubai Wharf Green Wall is a prime example of our holistic approach to well-being in our communities, as it instils a sense of serenity throughout the neighbourhood while supporting the local ecosystem and beautifying the surroundings. In addition, having a new Dubai landmark at their doorstep is a matter of pride for the residents of this community." Green walls are a relatively new concept worldwide, with 93 percent installed after 2007. Found mostly in urban environments, where the plants help reduce the overall temperature of the buildings, many of the best-known green walls are located in public places, such as airports and shopping malls. Heat build-up in cities is primarily caused by the absorption and subsequent emission of solar heat in asphalt roads and building materials. Plant surfaces can help offset this occurrence by reducing temperatures through a process called evapotranspiration. The effect can be felt more prominently in the immediate vicinity of a surface such as a green wall that can lower surrounding temperatures by up to five degrees Celsius. 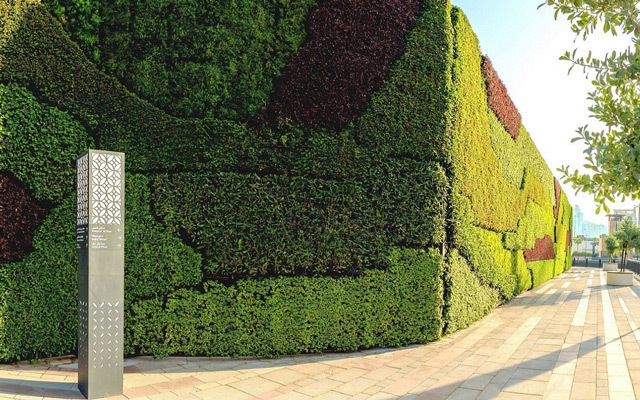 Developed by landscaping experts Gover Horticulture, the Dubai Wharf Green Wall is made using geotextile grow bags filled with peat substrates enriched with nitrogen, phosphorus and potassium (NPK). This allows for better root growth, irrigation and drainage in the UAE climate that can often get quite harsh during the long summers.